We took off with the resort’s own pickup truck at elevenish from Haad Gruad, after settling our tabs. As usual, the driver was aggressive, but not overly dangerous in my opinion – I really don’t understand how “everybody” who’s been to Thailand or similar places complains about drivers being dangerous. Yes, they drive with a bit smaller margins, but at least they’re attentive, which is more than you can say about most cell phone wielding, GPS programming cagers around here. He dropped us off at the pier with lots of time to spare, so we had breakfast straight from the meal wagons that were set up there. A great-tasting tuna sandwich and one quarter of a huge pineapple set us back 70 THB. The boat was a bit late as usual, but nothing bad; we got on about half an hour after schedule. After arrival at the pier in Mae Haad, we quickly found a dockside restaurant to sit down and have a meal (fried rice and Pad Thai noodles respectively), and to discuss what to do. As usual, we didn’t have anything booked here, and we didn’t want to make the mistake we did the last time we were here, of killing ourselves while searching for accommodation. 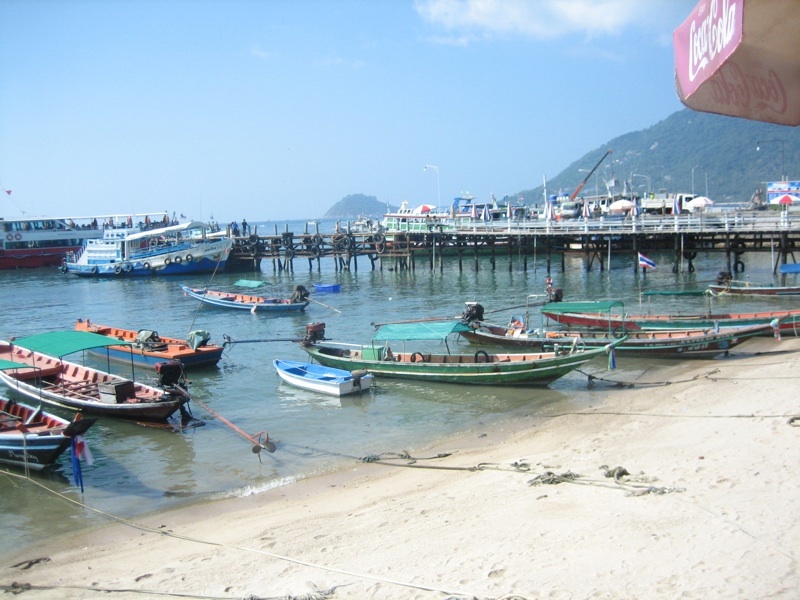 Koh Tao seems to be a couple of degrees hotter than Koh Phangan, and it’s a bit harder to find good rooms at a good price there, so it requires some actual work to find something good. The Thai seem to have forgotten what the word spicy means, but that was easily corrected with the supplied piri piri in rice vinegar, and the dried, crushed chili. After the meal, we asked Madeleine and Jasmine to stay in the shadow in the back of the restaurant, while Tanja and I went to search for a travel agency to get some hints about where to look for bungalows. We found a great place along the main street on the way up from the pier, called Angel Travel, run by a French or Italian guy (I couldn’t tell, but he spoke both languages fluently and had a touch of latin accent in his English), with a great outlook on life and a massive amount of service mindedness. We rented two bikes from him, and got some directions for resorts within our budget. 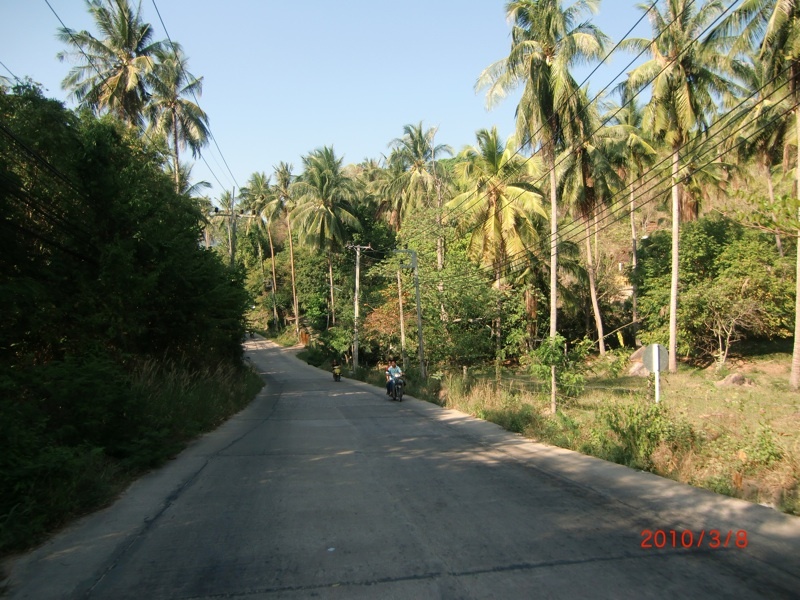 On Koh Tao, the roads are drastically worse than on Koh Phangan. There are places that will offer you scooters with the usual tires made for paved roads. If you happen to be offered one of these, go someplace else. On this island, it’s knobbies or nothing. Also, I learned that scooters with half automatic shift are completely useless when riding two up. Click-i for the win, there. After making sure we had transportation, we went for the girls and our luggage, and were told that we could leave our bags at the tourist agency as long as we came by to pick it up before 8 in the evening, so we just took the smaller bags containing the rest of our passports, money, etc, and left our bulky travel packs for later, and then headed out to find the places we’d been recommended. Since it was high season, they were all full, so we went on to search on our own. The place we really wanted to live in, that we had seen the last time we were on Koh Tao, is called New Heaven, and is situated about as far down south you can get along the main road. Unfortunately, it was fully booked for at least another week. After some more riding and stopping and asking and riding, we found a place called Sunshine Resort. They offered pretty hot (as in temperature) bungalows with the AC turned off for 550 THB and a take it or leave it approach to customers. Perhaps they’re more positive to customers who also make use of their diving program. But since it was getting late, we really didn’t have much choice but to accept it. After paying for our rooms, Tanja and I took our bikes and fetched the luggage we had left behind in Mae Haad: One backpack on the back, one in front, and a smaller bag between our feet or in the basket in front, respectively. Who needs cars, right? In the evening, we joined up with some friends who had been here for some time already, getting their diver’s licenses. Jouline and Daniel, and Joulines sister Madelene, with her husband Renato, who had managed to get some bad food and was lying sick at the hotel while we went out to grab a bite and a beer, so unfortunately, we actually didn’t see him for the entire time we were there. Look, they're playing with fire! We met up by the 7-eleven in Chalok Baan Kao and went to Sai Ree Beach, which is just about what Haad Rin in Koh Phangan should’ve been like for me to really enjoy it. 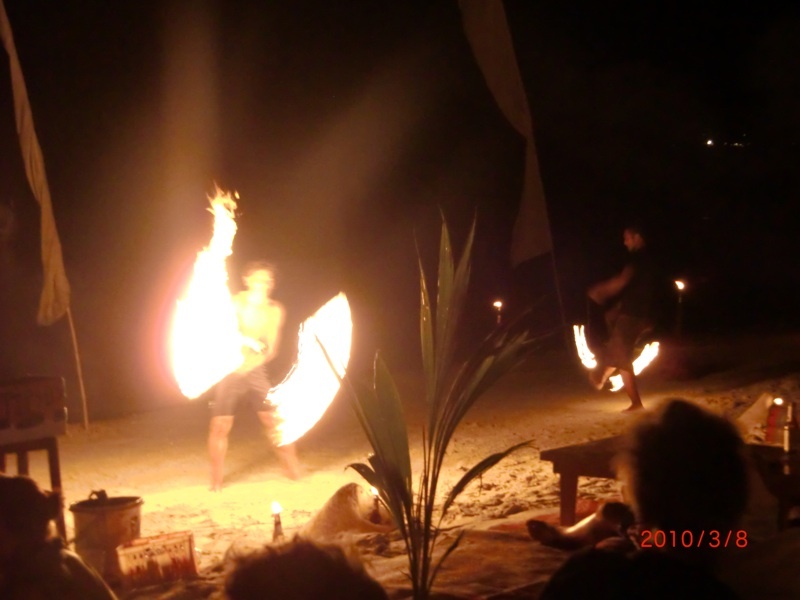 We had some food in a restaurant by the beach, and then walked up and down to show Madeleine and Jasmine the bars, and finally ended up on Ban’s, enjoying some beer along with live music (later exchanged for a live DJ) and a nice fireshow on the beach. Their lamps were simple but effective: Chang beer bottles with a small amount of oil in them, and a usual linen wicker. All in all we had a great evening, followed by a lousy night. The bed in our room had a straw mattress, which meant that the only possible position to sleep in, was on one’s back. Combine that with a rotating fan that made a nasty grinding sound twice every turn, to get the result: Only sheer exhaustion let us get any sleep at all that night.